Transform your tired wood fireplace into an efficient work of art. There is nothing worse than being cold and wet. But what if you didn’t have to be? What if you came home and with the flip of a switch had a roaring fire? No more chopping, hauling, building, lighting and waiting. The Napoleon GL18E Gas Log Set is the solution. With one box you can transform your tired wood fireplace into an efficient work of art. The GL18E Gas Logs install with ease, only needing your existing gas line. The GL18E’s hand painted logs are unique to every box. No two logs are the same. Napoleon’s exclusive burner produces the highest and most realistic flames in the industry. The fiber burner cover absorbs the heat from the flames and glows like a real wood fire. The heat that the GL18E produces heats the logs as well. They radiate the heat out into your space making you cozy and warm while enjoying an effortless fire. Relax. There is no remodelling required for the GL18E Gas Log Set. It uses your existing wood burning fireplace to vent. 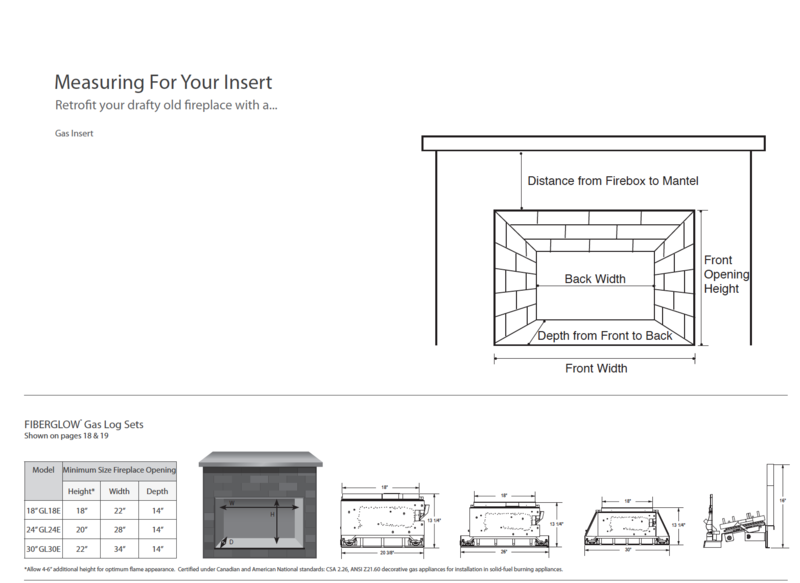 Purchasing and installing a Gas Log Set is far less expensive than buying a new gas insert. The savings don’t stop there. Turn the furnace down and use the GL18E to heat the room you use most. You will save money on your heating bills. Once you’re done using your Log Set, just flip a switch to turn it off. You no longer have to wait for a wood fire to burn out. And the residual heat absorbed by the logs will continue to heat the room after the fire has been turned off. Life is happening at a faster pace. Things need to be quicker. Napoleon’s GL18E lights quickly with just the flip of a switch. Even during power outages. Rely on your Gas Log Set to keep your home and family cozy and warm no matter what. Don’t waste time chopping wood, hauling and hoping that your fire catches. No more wasted time waiting for the fire to burn itself out. The convenient on/off switch allows you to have a fire when you want and need it and turn it off when you’re done. Every GL18E Gas Log Set comes in one box with the burner assembly, unique ceramic fiber burner cover, black cast iron andirons and grate to hold the hand painted logs, lava/ember rocks, and charcoal lumps.